Human sacrifice as shown in the Codex Magliabechiano, Folio 70. Again there was sounded the dismal drum of Huichilobos (Huitzili) and many other shells and horns and things like trumpets and the sound of them all was terrifying, and we all looked towards the lofty Cue [Great Temple] where they were being sounded, and saw that our comrades whom they had captured when they defeated Cortés were being carried by force up the steps, and they were taking them to be sacrificed. When they had got them up to a small square in front of the oratory, where their accursed idols are kept, we saw them place plumes on the heads of many of them and with things like fans in their hands they forced them to dance before Huichilobos, and after they had danced they immediately placed them on their backs on some rather narrow stones which had been prepared as places for sacrifice, and with stone knives they sawed open their chests and drew out their palpitating hearts and offered them to the idols that were there, and they kicked the bodies down the steps, and Indian butchers who were waiting below cut off the arms and feet and flayed the skin off the faces, and prepared it afterwards like glove leather with the beards on, and kept those for the festivals when they celebrated drunken orgies, and the flesh they ate in chilmole. In the same way they sacrificed all the others and ate the legs and arms and offered the hearts and blood to their idols, as I have said, and the bodies, that is their entrails and feet, they threw to the tigers and lions which they kept in the house of the carnivores. "The sacrifices, which had so horrified Díaz del Castillo, were not mere acts of barbarism, but a sacred reenactment of that victory over the dark forces that constantly threatened the stability of the Mexica world. This hill in the middle of the island on the great lakes of Tenochtitlán was the focal point, ... the central point on the vertical plane in which human beings, gods, and their spirits existed. The souls of the Mexica dead went down through nine planes to reach the realm of Mictlán. The gods dwelled on the thirteen higher levels, while at the highest sat the 'lords of creation' of the myth, Omeyocan and Ometecuthli. It was the Templo Mayor that offered access to all these worlds. "But this world was an unstable one, in which the forces of life, the sun, and the water god Tlaloc, who also had his temple at the top of the sacred hill, were constantly threatened. Human sacrifice was needed to ensure that the cycle of life and death continued as it should, with the rebirth of the cosmos at the end of each 52-year period that the Mexica calendar described. "The Florentine Codex of Mexica history describes this moment of dread, when the Mexica were unsure whether the world would be renewed or come to an end in disaster. As the closing days of the old period approached, everyone in their homes put out their domestic fires, swept the hearths clean, and threw their household gods into the waters of the lake. On the fearful night that had been calculated as the end of one great heavenly cycle, the fire priests and a chosen warrior climbed the Hill of the Star in Tenochtitlán. All the people watching 'with unwavering attention and necks craned towards the hill became filled with dread that the sun would be destroyed forever.' The priests watched the progress of the constellation we know as the Pleiades as it moved across the heavens on that one night after 18,980 nights. Seeing that it still moved through the night sky, the priests saw it as the sign that the world had not stopped turning. A small fire was then kindled. The warrior was laid out on the sacrificial stone, 'then speedily the priests slashed opened the breast with a flint knife, seized the heart, and thrust it into the fire.' 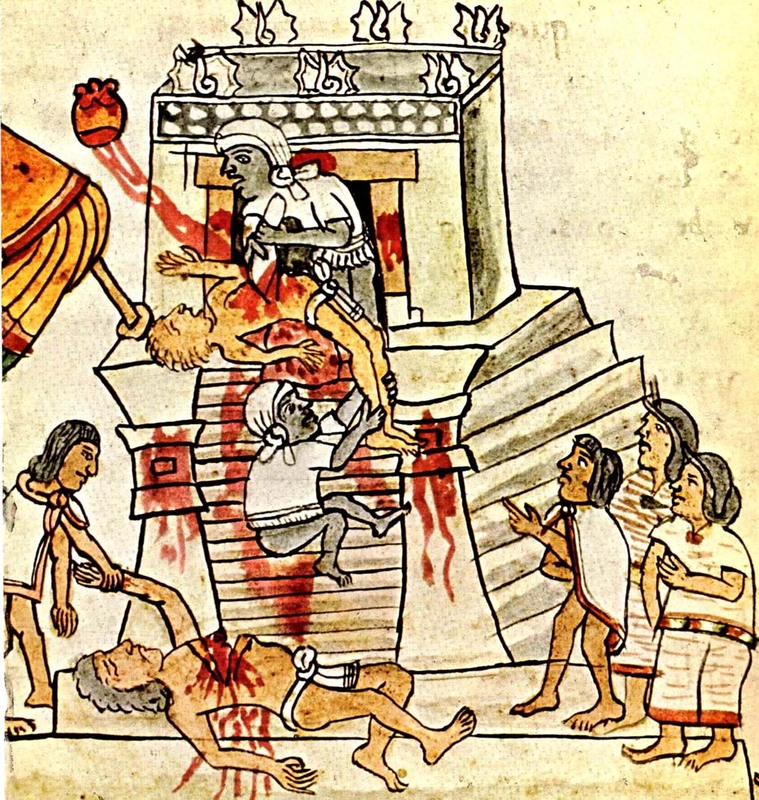 The people of Tenochtitlán cut their ears 'and spattered their blood in the ritual flicking of fingers in the direction of the fire on the mountain.' That fire was taken down from the Hill of the Star and conveyed by priests to the Templo Mayor, where it was placed in front of the statue of the god. Messengers and runners then took fire back to all the towns of the empire, where people rekindled their fires, sure in the knowledge that the stars and the sun would continue on their way for another cycle of 52 years. "However solid and imposing the Great Temple looked to worshippers and to Spaniards alike, the world that revolved around it was a fragile one. And when Cortés and his men arrived toward the close of one of these 52-year cycles, it seemed like a confirmation of the Mexica's worst forebodings." In any culture there were nonbelievers, for instance in Ancient Greece plenty of people understood the god worshiping rituals to be be nonsense, but played along or did nothing to interfere only because of the danger always inherent in religious dissent. With religion and worship of gods always comes totalitarianism, the two are inseparable. "The various modes of worship, which prevailed in the Roman world, were all considered by the people, as equally true; by the philosopher, as equally false; and by the magistrate, as equally useful." Edward Gibbon, The Decline And Fall Of The Roman Empire.